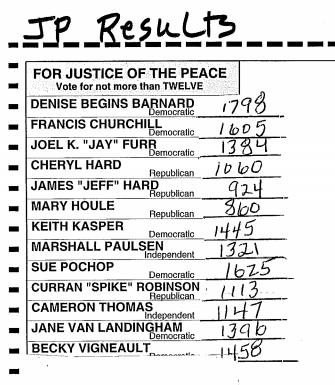 I finally got to see the vote totals for the Justice of the Peace race here in Richmond, VT (population, a bit over 4,000). Slightly longer version of the story: so did 11 out of the 12 other candidates on the ballot. I was one of seven Democrats on the ballot and (if I recall correctly) the only first-timer among them. There were four Republicans and two independents on the ballot as well. A town our size is permitted to elect 12 JotPs, so with 13 candidates on the ballot, only one person would lose out. I was interested to see that I came in last out of the seven Democrats but ahead of all the Republicans and independents. I honestly don’t know most of the people on the ballot even though I’ve lived in town sixteen years. I travel so much for work that I can never show up at selectboard meetings and so on, and what’s more, I’m not a native of the town. I assume that the other Democrats are all prominent enough that they had greater name recognition and consequently got more votes than I did… and that my total wasn’t based on my being my being more popular than the six who finished below me but rather was due more or less entirely to running as a Democrat. The woman who got the most votes, incidentally, is our former state representative and owns the hair salon on Main Street. Everyone knows her. So basically, I’ll be on the town election board when my position officially starts on February 1. I hope I get to conduct a marriage ceremony at some point. Don’t think I’m impressed by my accomplishment — running in a race where 12 out of 13 candidates got elected, and where the powers and responsibilities are so slight, is not going to go to my head. But I am looking forward to doing my part. I’ll have to plan my 2019 travel schedule around Town Meeting Day and elections since I’ll need to be present.